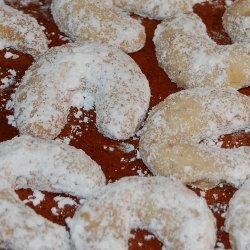 This Vanillekipferl recipe (Vanillehornchen) comes directly from Oma’s recipe box. These powdered sugar covered almond crescent cookies (along with Linzer Augen) always dominated the Christmas cookie tins sent or set out every year. Made perfectly these cookies are very delicate, but that means that they leave behind some tasty crumbs. Don't forget that you will need quite a bit of extra powdered sugar for dusting after baking. The powdered sugar listed in the ingredients is just what is used for the actual making of the dough. Oma used to store her Vanillekipferl just about buried in powdered sugar and pulle them out to serve.